Fantasia International Film Fest 2018 Review: Prepare to enslave yourself to the paralyzing fear of the Indonesian horror film SATAN’S SLAVES. Ari Aster, the writer/director of HEREDITARY, described his movie as “the corrosion of grief.” SATAN’S SLAVES, from writer/director Joko Anwar, is similar in many ways to HEREDITARY, except that instead of focusing on the corrosive nature of grief, SATAN’S SLAVES focuses on the strength of family unity. 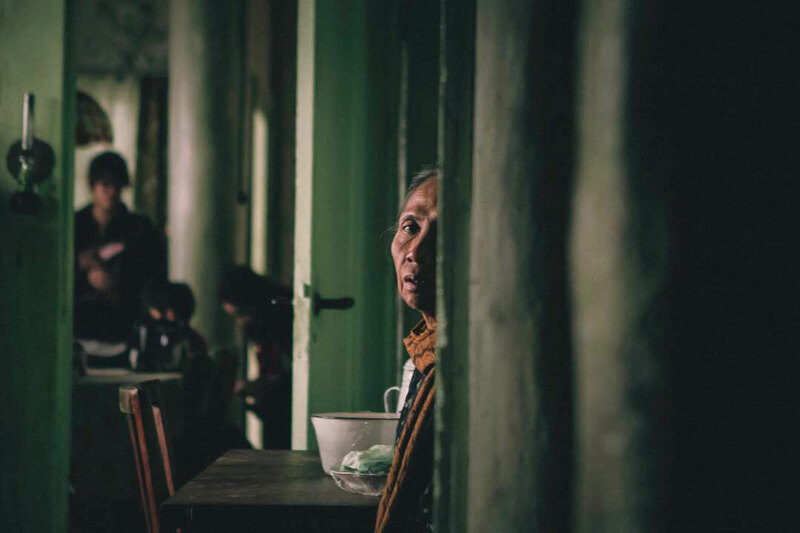 Set in 1981, a family living in the Indonesian outskirt town of Jakarta faces financial hardship in the wake of the mother’s severe health conditions. Mother (Ayu Laksmi), once a popular and famous singer, is bedridden and only communicates by the ringing of a small bell. The daughter, Rini (Tara Basro), is essentially running the household during her mother’s illness. Father (Bront Palarae) is out of work as he stays home with his family, but seems to be waiting for his wife to pass away. There are also three sons in the house: Tony (Endy Arfian), Bondi (Nasar Annuz), and Ian (Muhammad Adhiyat). When the bell rings from the top floor of the house, the entire family freezes and a slow terror passes over their faces before they decide who will go upstairs to look in on Mother. Mother is nearly catatonic — a woman who needs grooming, bed changing, and to be fed. 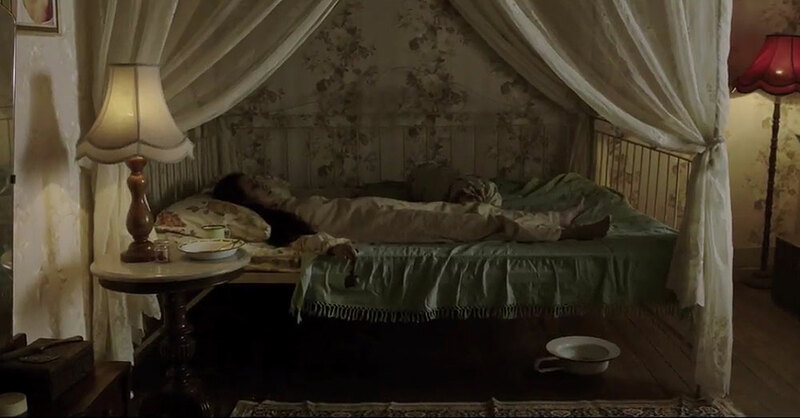 But, here, at the end of her life she begins to stare into corners of her room and at the bedroom window. To Mother, something is there but remains unseen by her family. When Mother finally passes away, there is sadness but relief for the family. Father announces he will be leaving for a few days to find work and leaves Rini in charge while he’s gone. On father’s first night away, the terror begins. The kids begin to hear the ringing of the bell. Mother’s most popular song plays through the radio, and then the children begin to see an apparition they believe to be Mother’s ghost. It may seem redundant to speak of a movie as “the scariest movie in years,” or even, “a film that ranks with THE EXORCIST and ROSEMARY’S BABY as the best of horror movies.” I don’t view that as overhype or hyperbole, but an acknowledgment of the quality of horror films being released over the last few years. I’m going to add to it with SATAN’S SLAVES. This movie is as creepy, frightening, turn-your-head away, grab the nearest person’s arm, scary as the recently released HEREDITARY and classics like THE EXORCIST, THE OMEN, and NIGHT OF THE LIVING DEAD. SATAN’S SLAVES, despite the grindhouse sounding title, takes the time to introduce the main family to the audience. As the audience gets to know these characters, the familiarity helps build on the terror of their predicament. Some might interpret this as a statement that the film has a “slow build.” While Joko Anwar does take the time to give depth to the family, there is no delayed introduction to the horror in SATAN’S SLAVES. The scares are there, nearly immediately, and continue to build throughout the movie to its incredible climatic ending. Anwar layers his movie with strong characters and an escalating horror that includes more than a few scenes of scream-inducing terror. SATAN’S SLAVES is for horror fans who thought HEREDITARY was too focused on family drama and not enough on traditional horror. SATAN’S SLAVES gives audiences the drama and the horror in equal abundance. I predict that SATAN’S SLAVES will give many audiences a few sleepless nights after watching one of the best, and most terrifying, horror films of 2018. Want a second opinion? Click here to read an alternate take on Satan’s Slaves.